2:30 "We're going to record a Season 1 wrap-up and summary podcast." Here's another reminder for you to reach out to us via email at thebigguy@holdmyorderterribledresser.com. 5:10 "Hey! You're young and swingin'..." Listener, friend of the podcast, and a guy you juuuust may be hearing more from around these parts very very soon Jeff Wikstrom notes we included neither Johnny's v/o nor the classic outro lyrics "Bye-byeeeeee..."
7:30 Outtakes. Orson Welles is pretty much infamous at this point, yeah. Here's William Shatner being all Canadian and pronouncing the word "sabotage" just. How. He. Pleases. Winnebago Man! That's probably the best compilation of the immortal Jack Rebney and you should definitely check out the documentary. And yes, here's Fourth Doctor Tom Baker getting fed up with dumb, dumb advertising people. These clips are Not. Safe. For. Work. Don't sabotaaaage your jobs, kids. 12:25 Richard Sanders sang the theme? The urban legend is confirmed here on Wikipedia. And I am guessing that New WKRP In Cincinnati commercial has dropped off the face of the planet; it's not on YouTube. Gasp! 15:25 So do you think Ferryman the name is a play on Greek mythology, Charon, the ferryman of the dead? As we air this episode, a NASA probe, New Horizons, is approaching both Yuggoth, er, Pluto and its satellite... Charon. SPOOOOKY coincidence. 15:50 "Fred Stuthman started his career as a local TV horror host." This site gives you a list of 337 local horror hosts. That's a big guild. 17:00 The Blood Sucking Monkeys from West Mifflin PA. Yes, that site even lists Count Floyd. 21:30 The funeral home industry. Every five years there's a big mainstream media scare piece where we all pretend to be shocked at the state of the funeral home industry, but it has been in a state like this for at least the last 30 years or so from every bit of evidence out there. 24:35 "Our product's kind of crap; don't buy it." I just finished Thomas Frank's The Conquest of Cool, which honestly I personally wasn't impressed with, but the subject matter (advertising's role in shaping and being shaped by the counterculture) was absolutely fascinating. 25:22 Golden Words. [Rob:] Let's see what my old campus humo(u)r paper looks like in the 21st century. Hmm. Star Wars cover, Cthulhu jokes, "Getting Blackout Drunk: An Introspective." What do you know: you can go home again! (Definitely see an Onion "Area Man" influence on some of these but that would be very hard to avoid, just as the paper in my era owed an awful lot to The Simpsons.) Plus, yes, Reel Big Fish. We loved our ska in the Roaring Nineties. 26:55 National Lampoon's Sold Out issue. They didn't do a Sell Out issue; they did a Sell Out BOARD GAME. More misty 1978 memories, I guess. Thank you, Board Game Geek. 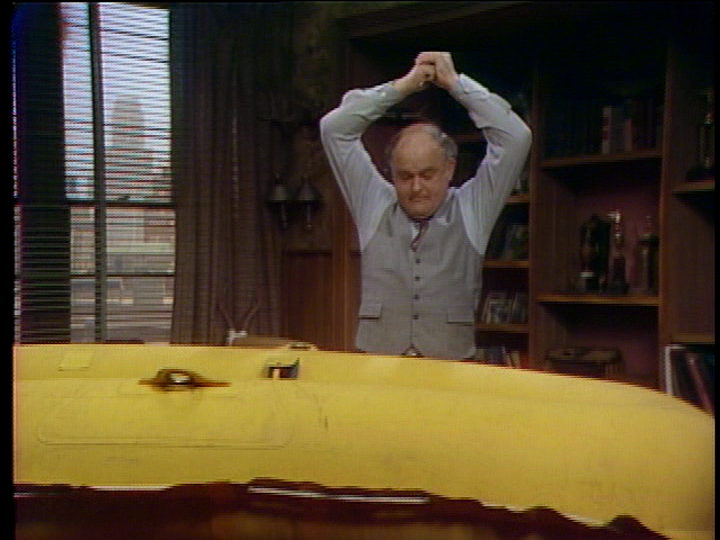 28:20 "This is just like the Ferryman Funeral Homes episode of WKRP!" Friend of the podcast Lenore kicking some Darmok communication in sitcom metaphor there. 33:20 "Alan Alda kind of took over the show..." This isn't a war, it's a murder. 38:10 "You know the movie The Green Berets..." The "Goofs" section of The Green Berets on IMDB is worth a chuckle at. 39:20 "It's kind of the New Hollywood counterculture directors..." It's absolutely shocking to see WKRP in the company of these great filmmakers in taking on this topic. And when you look at 1978 on this list and see this is really the beginning of media being able to take this sort of thing on at all... man. 46:30 The New Earth Army. Yes, this may have been a tiny bit discursive, but one of the central conceits of the fictionalized movie version of The Men Who Stare At Goats was Jim Channon/Bill Django's desire to revitalize a moribund post-Vietnam U.S. Army with New Age beliefs. And while it is apocryphal that Jim Channon came up with the Army's "Be All That You Can Be" slogan, it is interesting to see the cross-currents of California New Age Human Potential thought and Reagan conservatism battling it out in the early 80s in the U.S. Armed Forces, although some might argue there's less daylight between those two poles than we might think. 46:50 "If there was a window for forgiveness, it would have been during the Carter years." Pardoning the draft evaders was indeed literally one of the first things that Jimmy Carter did coming into office, but it came on the heels of Gerald Ford's conditional 1974 amnesty for certain classes of draft evaders. As Rob notes, neither of these acts covered deserters. 50:10 Heart of Glass. Here's a great article on the artists that WKRP played and in some cases broke. Keep in mind that this article has some spoilers for upcoming songs. And I will post the Sifl and Olly version of "Heart of Glass" here without reservation or embarrassment. I feel like the creators of Sifl and Olly are solidly in that WKRP generation, because we're going to see another late-70s song that Sifl and Olly covered coming up soon in a WKRP episode. [Rob:] Aargh. I absolutely meant to use a clip of the Sifl and Olly "Heart of Glass" rather than the real Blondie version but then I forgot. I won't go back and edit it in now since I guess without the video it would just sound like somebody's karaoke take on the song, but still, Sifl and Olly are the best. Rock! HMOTD 008: What Do You Want, The World?